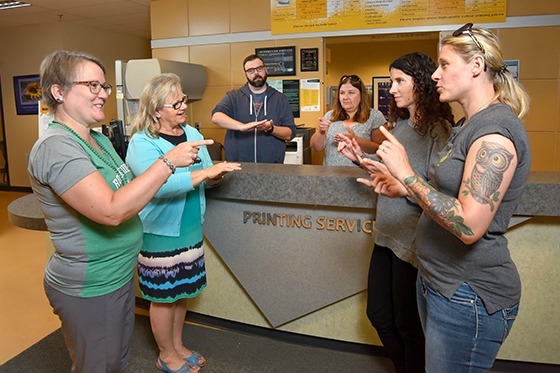 By Dale Johnson Posted: July 6, 2018 9:30 a.m.
Allison Vande Velde has been a bindery worker in Printing Services for 21 years, but there were times the fact that she is deaf left her feeling isolated from her colleagues. “I felt left out because they weren’t able to communicate with me,” says Vande Velde, who was born deaf and began learning American Sign Language (ASL) when she was 13 years old. When she shared her feelings with Judy Peace, her manager, Peace decided to do something – have team members learn American Sign Language (ASL). “When I started here as manager 10 years ago, the only communication with Ally was through written notes. I know that Ally has experienced frustration with feeling left out and I was trying to think of a way to change that. I took a beginner course in sign language, but I found it difficult because I really didn't have anyone to practice with other than Ally, and she was too fast for me,” Peace recalls. That was in the fall of 2016. After learning a few basic words, they decided to learn how to sign a Christmas song. “That turned into us performing a Christmas carol as our department Christmas e-card. We had a lot of fun doing it and it was very well received,” Peace says. They’re already planning this year's Christmas e-card – and will start practicing soon. 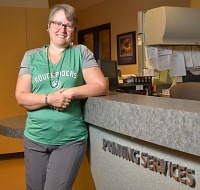 Peace says signing is a great team building exercise for the nine staff in Printing Services. ASL, the predominant sign language in most of anglophone Canada and the United States with an estimated 250,000 to 500,000 users, has been in use for 200 years. “I am impressed that people in Printing Services can communicate with me through American Sign Language (ASL),” says Vande Velde. This is another example of how people at the U of R can practice inclusiveness and demonstrate acceptance of all kinds of people. Peace has some advice for other groups that may want to accommodate employees by learning new ways to communicate. “If they don't have someone in the group who can teach them, then utilizing the internet is great. We have some good sessions when Ally is away. We've created flash cards with common words. One of the biggest challenges is to dedicate those few minutes every day to commit to doing it,” she says. “With our commitment to learn to sign, Ally realizes that we respect her as an individual and care enough to communicate with her, other than writing notes back and forth – and she is appreciative of the effort. She's eager to teach us, and I think that has made her feel more included. Learning ASL has made us all more conscious of people's needs, and has therefore made us all better customer service representatives of Printing Services,” Peace adds.